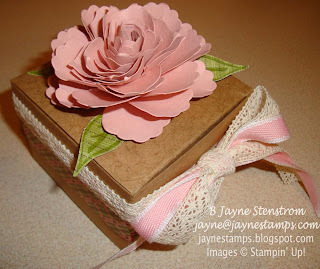 I am so fortunate to know my stamping friends! They are all such a blessing in my life in one way or another. Isn't it pretty? It's made with one of the Kraft Gift Boxes from the Holiday Mini Catalog. What? You missed seeing those when you looked through the catalog? Well, check it out again and look at page 15 at the bottom. And see the DSP on the side of the box? Would you believe that it's from one of our Christmas Designer Series Papers? It's from the Letters to Santa DSP, but the colors are so soft and sweet that you could use it for all kinds of things. The rose is breathtaking, isn't it? It is hard to believe that it's made from cardstock. 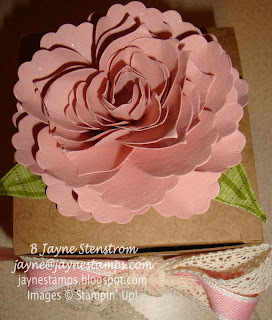 The flowers are cut from Blushing Bride cardstock using the Fun Flowers Bigz L Die. Deb even stamped a pattern all over the box. Every little detail just adds something special. 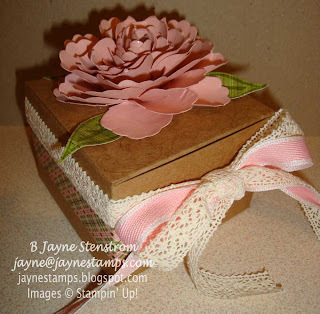 As a final touch, she tied some Blushing Bride 1/2" Stitched-Poly Ribbon and Chantilly 1/2" Crochet Trim around the box. I felt so special! Thanks so much, Deb!! If you'd like the instructions to make one of these roses for yourself, Deb has a wonderful step-by-step tutorial on her blog HERE. Hope you enjoy - and if you make one yourself, be sure to send me a picture! 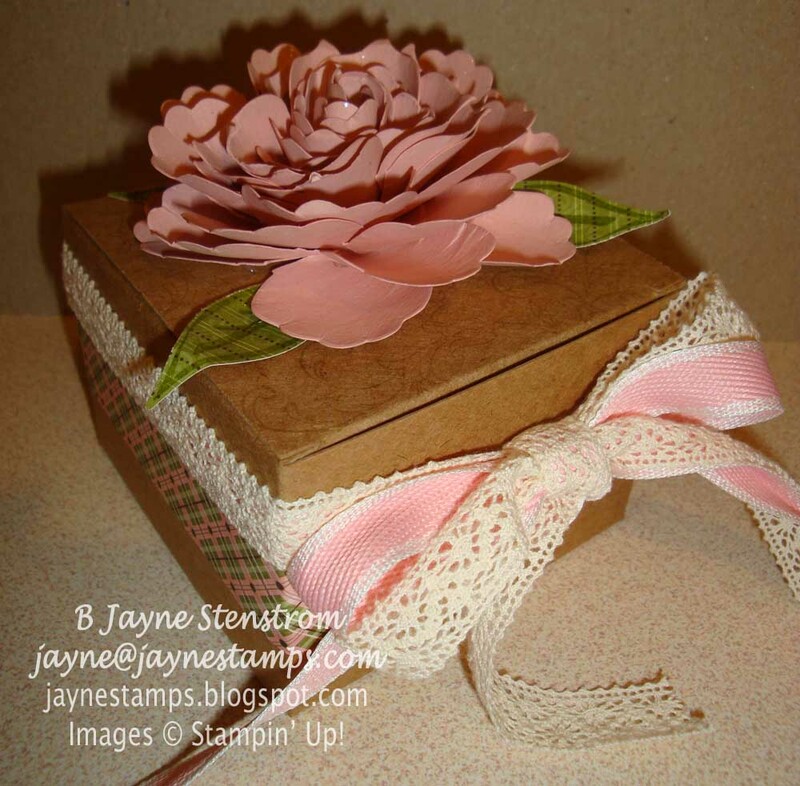 Jayne, I love your box, and wow, what a fantastic flower! Great job, beautiful! Thanks Jayne! I LOVE getting together. We have so much fun. Come on everyone. Make a rose! You know you want to!